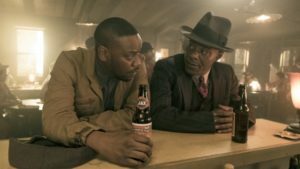 One of the aspects that’s made season two of Timeless a lot of fun is its willingness to play around with the established formula of its first season. Every time the show takes a step away from the paint-by-numbers format (Lucy, Wyatt, and Rufus on their trip of the week), it challenges the narrative in ways that make the episodes feel almost like mini reboots. And it’s exciting! Sure, we love the original trio, but now that we can change it up a bit, it gives Timeless a chance to explore different character dynamics. 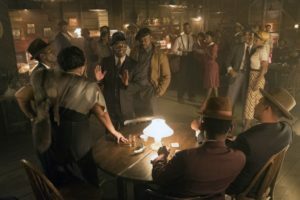 “The King of the Delta Blues” flips the narrative on its head with one of the biggest changes we’ve seen on Timeless: a game changer for time travel. Rufus and Jiya successfully configure a way to add another seat to the Lifeboat, allowing for four passengers to travel safely through time. Their geeking out at this new development is adorable; Rufus attacks Jiya with kisses as they celebrate. And as it happens, they make immediate use of this latest development after the Mothership lands in Depression-era Texas. Since the rest of the team in the bunker is at a loss, it comes as a surprise by all that Connor Mason knows exactly why Rittenhouse has chosen that time and place. He’s drunk—bottle of booze hanging from his fingertips, quoting Shakespeare, and mourning the loss of Mason Industries—but manages to rattle off the necessary historical information. Robert Johnson, it turns out, is Mason’s historical fave and he’s appalled that none of the Time Team know about him. (As he rightfully should be). Johnson, an American blues singer-songwriter, was one of the artists responsible for influencing the rise of rock’n’roll, inspiring the sound of countless classic bands and artists. Without that music, the counterculture of the sixties wouldn’t exist, giving Rittenhouse the foothold they need to carry out their nefarious plans. Mason, the resident Robert Johnson expert, is chosen to accompany Lucy, Rufus, and Flynn on their mission…only he’s not so on board with the idea. He invented this time machine, but he’s never actually taken a trip. (The team’s unanimous outraged reaction to this is pure gold). All of this talk of time travel and Mason’s scared out of his wits because it’s “bloody dangerous.” Mason’s inaugural voyage ends with him throwing up once they land, which Flynn finds amusing. Weird antagonist/ally status aside, Flynn is both hilarious and dangerously charismatic when he’s not trying to kill the Time Team. Back at the bunker, Agent Christopher has Wyatt sit out this trip for a different mission. After being accosted by Carol Preston and Rittenhouse minions last episode, she’s pinned down the location of a possible Rittenhouse headquarters. It’s probably a good idea that Lucy and Wyatt are going their separate ways this week, considering things between them are awkward at best. It’s been made worse by the fact that Jessica has now moved into the bunker with everyone else…which really is a buzzkill. Who authorized that decision? Wyatt’s mission leads him to the real Rittenhouse HQ where Carol and Grandpa Keynes have been holed up plotting their takeover. Keynes has a nifty self-destruct button that sets all their data on fire the moment Wyatt infiltrates their building. (He’s beginning to catch onto this modern century). When ordered to take out Lucy’s mom, Wyatt can’t act on Agent Christopher’s command to take the shot. So, Grandpa Keynes, Emma, and Carol make a quick escape in the Mothership, and Wyatt gets a lecture from Agent Christopher. She doesn’t know what’s going on between him and Lucy (though she probably has some idea) but she begs Wyatt to sort it out before it interferes with his work again. Wyatt sparing Lucy’s mom is a sure sign that his feelings for her are definitely still there…and he needs to figure out what he actually wants, preferably soon. In 1936 San Antonio, Mason asks the others, “How do we begin?” to which Lucy and Rufus reply, “Get some clothes. Steal a car.” You know, just a normal day at work here on Timeless. Mason points the team to the Gunter Hotel, where Robert Johnson recorded some of his legendary songs including “Cross Road Blues” with Don Law, his producer. Earlier in the episode, we got a glimpse of this infamous recording session and the attention to historical detail, as always, is one of the most enjoyable aspects of seeing these stories come to life. Kamahl Naiqui portrays Robert Johnson this episode and sounds amazing while doing so, giving a few performances of notable tunes while capturing the raw emotion of Johnson’s music along with his blues guitar riffs. This episode does a lot to help endear us to Connor Mason, who was before nothing but a wealthy tech mogul whose work aided Rittenhouse’s machinations. We didn’t have much of a reason to empathize with him, even as he lost everything. But this episode shows a totally different side of him, and as he plays historian, surrounded by the history he’s studied his “entire life,” we get the feeling that this trip will humble him. 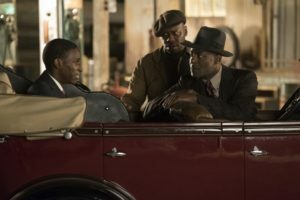 Rufus and Mason give Johnson a ride to his sister’s juke joint and spend the rest of the episode trying to convince him not to walk away from his guitar. Mason is full of fanboy glee in the midst of this warm, lively bar full of dancers and other iconic blues artists—Bessie Smith, Muddy Waters, and Eddie James “Son” House join them. Mason isn’t so great at keeping his future knowledge low key, or blending in with the past (he says he’s going to buy everyone a round of drinks…one wonders where he’s getting his money from?) but his delight at the whole experience outweighs any first timer mistakes. After another Rittenhouse agent kills producer Don Law, Mason takes her out—see, Mason, fanboys can definitely be heroes—before she kills Johnson. This leaves Mason with the responsibility of recording the music right there in the juke joint, if Johnson and Mason can be convinced to go through with it. Rufus steps in with the words Mason needs to hear, recalling a memory where he’d had a breakdown during finals week and Mason flew halfway around the world to show up at his door with a milkshake and double cheeseburger and his own words of encouragement. Theirs has always been a complicated relationship, but a meaningful one; Mason as Rufus’ mentor and father figure. The scene is moving with powerful performances by both Paterson Joseph and Malcolm Barrett, giving this multilayered connection between their characters a chance to take center stage for once. With his back turned to his audience, Robert Johnson records his influential music and Mason unwittingly cements his place in history. Later at the bunker, he hears himself exclaim “Yeah!” in Johnson’s recording. And, the record has been “engineered by Lando Calrissian,” which probably has some rather interesting cultural implications. (Bless this show and its constant Star Wars references). But, all is not well at the bunker for everyone else. Wyatt tells Lucy about his covert mission and her mother’s escape, but Lucy appears indifferent about her mom still wreaking havoc with her Rittenhouse cohorts. She rebuffs Wyatt when he asks for more juicy details about their trip, clearly jealous when the quartet emerge with Lucy and Flynn in good spirits. She tells him to go be with Jessica, and the look in his eyes when he watches her walk away speaks volumes. Wyatt’s suddenly had the realization that he’s lost Lucy and it will take quite a bit of effort to get her back to best friend and romantic partner status…that is, if he can finally admit that he loves her. Wyatt feels so duty bound to work things out with his wife, and that’s admirable, but he’s done it at Lucy’s expense. Like Agent Christopher said, he needs to sort his feelings out and come to the realization that he’s not the same person Jessica married. And in the meantime, Lucy is focused on taking care of herself. She’s lost everything, including Wyatt, who said he’d be there. He still is, but he’s holding back. In that absence, Lucy and Flynn have become reluctant friends (reluctant more so on Lucy’s part). This episode gave them a few bonding moments—again, Flynn was once again surprisingly tolerable and even though this might be the start of a redemption arc for him you can’t really ignore the fact that he’d been trying to kill her and the rest of the team not too long ago. But, if Lucy manages to find a friend who understands her on some level, then good for her. Their bonding moments culminate in Lucy showing up at Flynn’s door with a bottle of vodka, and although some might read their tension as romantic (they do have some great chemistry), Lucy probably just needs a drinking buddy to vent her feelings. The episode ends with a distressing development for Rufus and Jiya: a premonition where she saw Rufus die. Whether it puts a bigger strain on their relationship or brings them closer together remains to be seen, but we certainly hope this is premonition doesn’t happen to our hero in a hoodie.